Visitors to Vancouver can immerse themselves in Canada’s rich First Nations culture at the Skwachàys Lodge, an entirely aboriginal-themed hotel, opening this month. The property also features a sweat lodge and gathering places, including an artist’s workshop, smudge room (a room for religious ceremonies) and guest lounge. 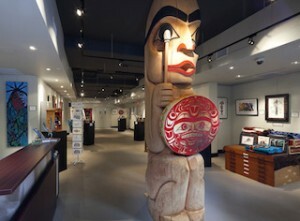 Skwachàys Lodge’s historic brick exterior is crowned by a traditional longhouse with a 12-metre-high totem pole, called the “Dreamweaver”, shooting toward the sky, and a video display celebrating First Nations culture sitting half-submerged in a glass sidewalk. Guests at Skwachàys will also have the opportunity to meet with local aboriginal artists and express their own creativity through hands-on First Nations experiences, such as carving, weaving and painting classes. With experiential-style hotels ‘with a conscience’ gaining popularity worldwide, Skwachàys is a great example of a sustainable business which provides social benefits to the local community. When it is completed, rooms will cost approximately AU$230 per night, a rate that is comparable to other Vancouver boutique hotels.